My mom prepares this vegetarian version of pho on auspicious days according to the Lunar Calendar when all Buddhists refrain from eating meat. 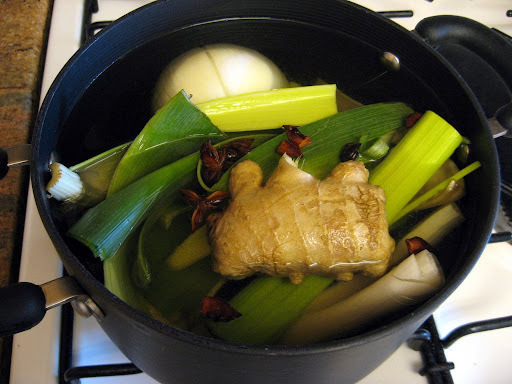 The broth is fragrant with star anise and five spice, while the “meat” is comprised of mushrooms and wheat gluten. 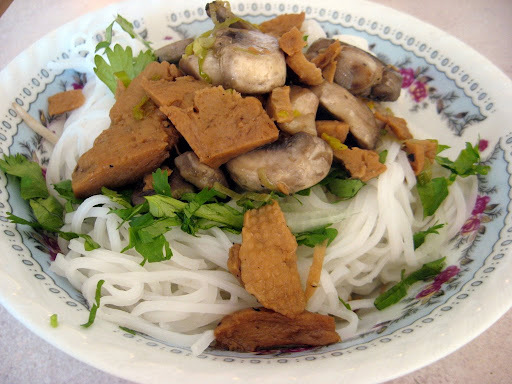 1 package of fresh or dried banh pho (flat rice noodles). Prepare according to directions on package. Make sure to rinse noodles well under cold running water after boiling. For the soup, heat vegetable broth and 10-12 cups of water in a medium-sized soup pot, leaving enough room for the ginger, onion and leek leaves. Remove the outer layer of the onion and add it whole to the broth. Leaving the skin of the ginger intact, chop off the nubs and bruise using a mortar and pestle. Add to broth. Separate the leek leaves from the stems and add them to the broth along with five star anise “fruits.” Let the soup boil on high heat for 45 minutes to an hour, or until the onion and ginger have softened. Once the onion and ginger have softened, discard the leek leaves. Add ¾ tablespoon of Chinese five spice to the broth and season with soy sauce and sugar to taste. Continue to cook on medium heat for an additional 15 minutes. While the soup is boiling, thinly slice the leek stems and chop the mushrooms and mock meat into bite-sized pieces. Deep-fried tofu can be used in place of mock meat if desired. Saute the leeks with vegetable oil in a medium-sized pan until golden. 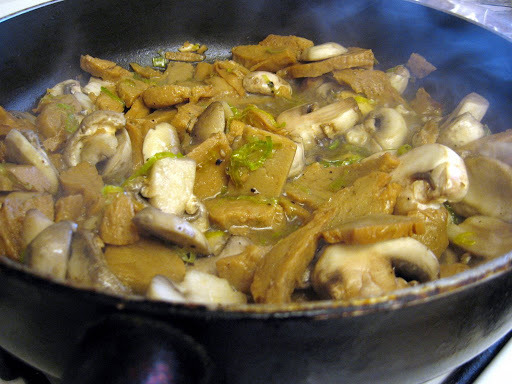 Add the mushrooms and “meat” to the leek and oil mixture along with half of the canned mock meat “juice.” Season to taste with soy sauce, mushroom seasoning and black pepper. Tip: My mom says to make the “meat” mixture slightly salty because the broth will balance out the excess saltiness. Grab a bowl and fill it with noodles and the “meat” mixture. Pour some hot broth on top. To garnish, add fresh or steamed bean sprouts, onions, cilantro, lime juice, herbs (basil, saw tooth herb, etc. ), hoisin sauce and chili sauce. Thank you, thank you, thank you for your mom’s veggie Pho recipe! Thank you! I’ve longed for a good broth recipe for quite some time. Now I want to buy a soup sock from Fante’s and go to town. Philly in the house!! Have fun with this one (I’m thinking lots more varieties of mushrooms for the next batch) and let me know how it goes. Woot. This is inspiring. I am going to make this! I’m so gonna try this! Thanks for sharing your mum’s recipe! 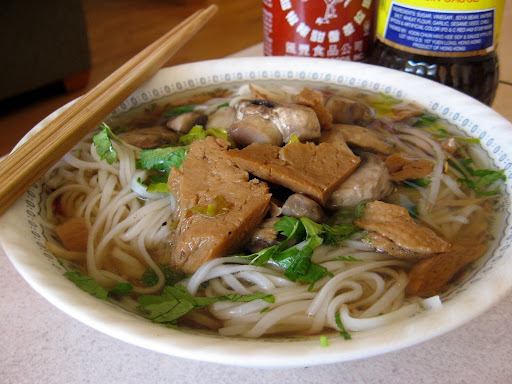 I’d never heard of a vegetarian pho, but I also didn’t know that there are meatless days in the Vietnamese calendar. The Greek Orthodox calendar has more meatless (no meat, no dairy, but shellfish are ok. Go figure) days than not, so while we aren’t very good about observing the fast calendar I’m always looking for something interesting to serve on those days. This would be a great one to try! Yum… thanks for sharing this awesome recipe. The broth sounds delicious. Stumbled! I made this for my family last weekend and they LOVED it. Thank you so much for sharing! Made this tonight; it’s magnificent. My thanks to you (and to your mom)! damn. this looks really good and not so complicated. This was great. I messed up a few things, but it seems to be forgiving. I ended up running around Portland looking for the Chinese five spice while the broth was boiling. I finally broke down and got the main ingredients for the 5 spice and used that instead, wasn’t too bad after all. I remembered eating nothing but pho ba. the veggie pho is just as delicious. Thanks for the great recipe! – I at least quarter the onions, and cut the ginger into smaller thick chunky strips. 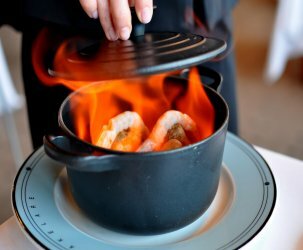 – The ginger and onion are then put over a gas hob on a naked flame (you can put them under a grill) for a couple of minutes or so to slightly cook them but really to burn them. Becareful to just burn them slightly! 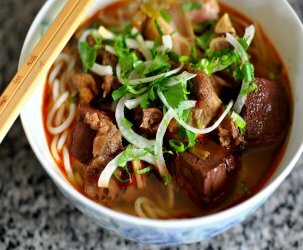 I find that the burnt ginger and onions in combination with the star anis gives the stock that authentic pho smell that we all know and love. Made the veggie pho 2 nights in a row, we liked it that much. I didn’t have the star anise and made the “4” spice with what I had available in the pantry (fennel, sichuan and black pepper and cloves). Still came out tasty. Thank you mom. 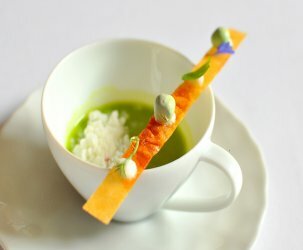 I made this soup last night. Oh, wow! It tasted so good! I made a few changes, but kept the recipe essentially the same. Thanks so much for the great recipe. Rice noodles are amazing! And the five spice powder added such a good flavour. I made this yesterday and IT WAS AMAZING!!!!!!!!!! I can’t believe I never tried pho before. I used extra firm tofu as the “mock meat” and the soup was incredible. Thanks for the recipe! My boyfriend thought it was delicious as well. 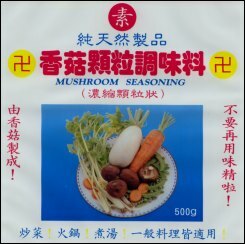 What’s a good mushroom seasoning substitute? I went to 2 chinese grocery stores and couldn’t find any! I have to make this. I am a huge fan of pho. I made this last night since the vegetarian BF came down with a cold. It was yummmy.. I made it with tofu and meatless chicken. Friends are already asking us to do a pho party in the near future 😉 Thank you for posting this recipe! Also, I never heard of Chinese 5 spice until now. It definitely made a different when I added it to the broth. Reminds me of how my parents would make Pho with Beef stock. Wonderful recipe! I have never had pho before but made your recipe and was just wowed over how good it was, I even blogged about it. I used tofu in mine. Delish! Thank you. 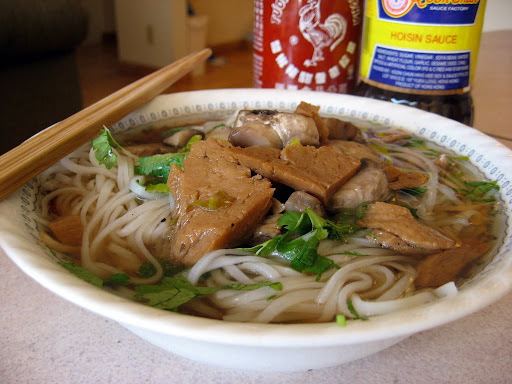 Hi I was addicted to Than Bros vegetarian pho chay in Seattle and have looked in vain for decent veggio pho recipes. Haven’t tried it but plan to. Thank you for posting this recipe. Thank you for the beautiful pho chay recipe! I saw someone else mention Than brothers in Seattle, and that is my sons and my favorite. I made the pho tonight and it was amazing. It was fun to read your reviews of Seattle restaurants as well. I used to bake bread for Tom Douglas and I live on Capitol Hill and love many of the places you went. I saw someone mention Tamarind Tree and I would wholeheartedly agree with that recommendation as well. wow!! this turned out GREAT!! i had been wanting to try pho for years but could not find a restaurant that made a veggie version. now i can make my own! thank you! chao em 🙂 hi V!